Walter White Would Be Proud Of This Breaking Bad Fries-enberg Mr. Potato Head | OhGizmo! Recently shown off at the NYC Toy Fair, the Mr. Potato Head Fries-enberg is the perfect toy to get… well, not your kids, that’s for sure. Well… maybe your young kids were allowed to Watch Breaking Bad so it might not be that inappropriate for them, but we like to think this particular toy offers more appeal to the grown-ups who have an appreciation for the famed TV franchise, and who still carry a bit of youthfulness in their hearts. 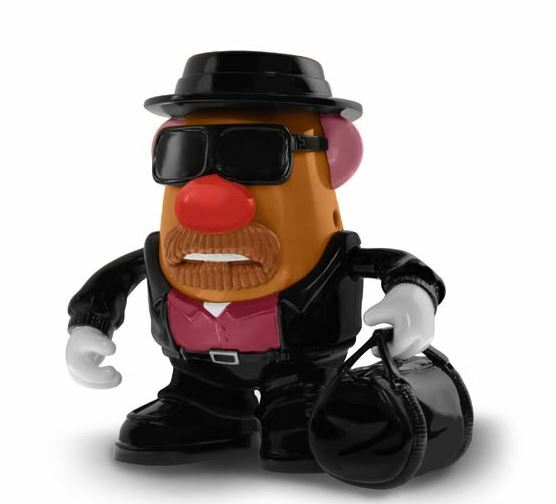 You can of course argue about the ethics of having a potato head also be a meth dealer, but we imagine you’re not supposed to overthink this $25 purchase, which will be shipping in April and is available for pre-order now.